Effective January 2018, the Colorado State Patrol operates the state’s Motorcycle Operator Safety Training (MOST) program. Visit the MOST program website. CDOT is working to make Colorado's roads safer for motorcycles. Motorcycle deaths have hit record levels in recent years – they are up 20% in last 5 years from 87 in 2013 to 103 in 2017. While motorcycles account for just 3 percent of registered vehicles on the road, motorcyclists are killed 26-times more frequently than passenger vehicle occupants. These fatalities tend to peak during the summer months with more motorcycles on the road. All drivers have the responsibility to watch for motorcycles just as motorcyclists need to ride safely and obey speed limits. CDOT's statewide motorcycle safety campaign aims to raise awareness of the importance of checking blind spots and looking for motorcyclists when turning. The campaign is directed at drivers, who often miss seeing motorcyclists on our roadways and in their blind spots. 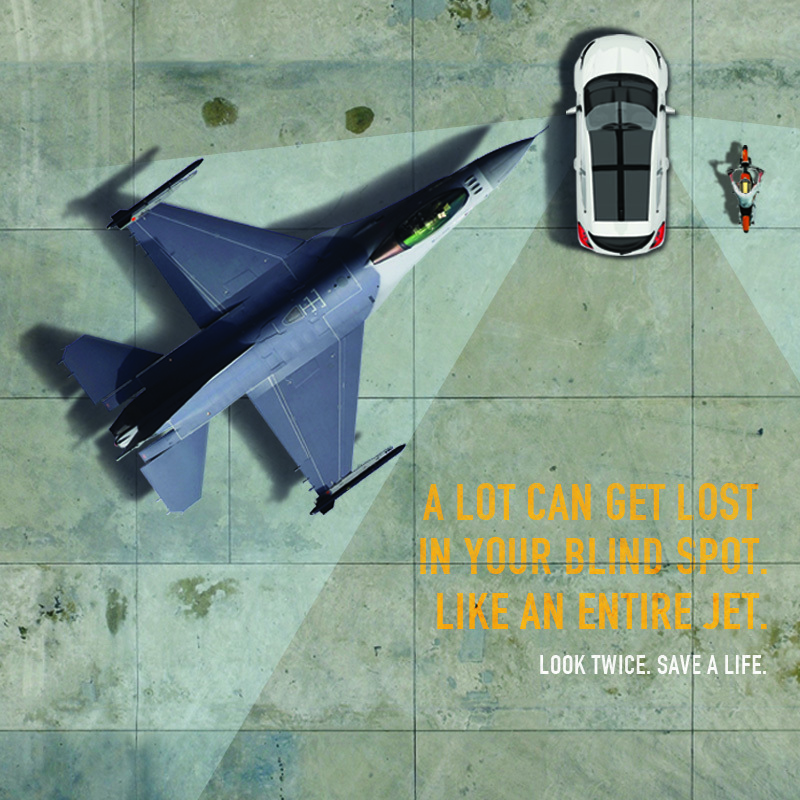 The average vehicle blind spot is 650 square feet which is large enough to fit a small studio apartment or even a jet. Motorcycle crashes also often happen when a driver turns left in front of a motorcycle the driver didn't see. Always remember to look twice before you turn left—because seeing a motorcycle after a crash is too late. Of course, motorcyclists can help reduce crash fatalities, too. Head injury is the leading cause of death in motorcycle crashes. Therefore, CDOT encourages all riders to wear helmets and other protective gear. There is a lot motorcycle riders can do to stay safe. Most importantly, they can get trained. The Motorcycle Operator Safety Training (MOST) program is conducted by the Colorado State Patrol and includes 12 training vendors across the state. See where motorcycles can ride for free without an Express Toll account or pass.